8v0, half-title, re & black title, xii, 248p. teg. Green cloth gilt Macmillan crest to board, gilt lettered to spine. Near fine copy. INSCRIBED TO A. LINCOLN BY DANIEL MACMILLAN, Nov. 1943 to ffep. 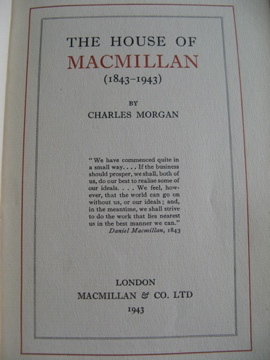 Grandson of the co-founder of the publishing dynasty and brother of the former P.M, Maurice Harold MacMillan.